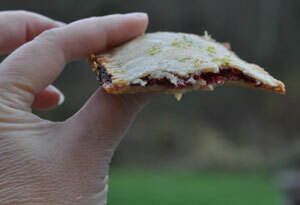 Yummy pear cranberry and raspberry lime poptarts! I try not to keep too much overly processed snack food in the house because if I did I’d be prime contestant material for “The Biggest Loser”. However, the Lieutenant has no such compunction. My worst eating days are when he brings home pop tarts; especially the delicious frosted cherry ones. I can put away six of those puppies at one sitting. What’s a girl to do? There has to be a guilt free way to eat pop tarts & I think I’ve figured it out…..make your own! 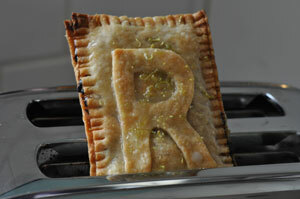 Pop tarts are really just flat little pies – so , nothing to them! I made two kinds of pop tarts: raspberry lime and pear cranberry. You can come up with your own combinations- its just a matter of boiling down the fruit with some sugar and corn starch. For the pastry, I used my old standby recipe, paige’s pie crust, and was able to make 9 pop tarts. I made a basic powdered sugar icing for the tops. Cook & stir constantly the pears, sugar, cinnamon and cornstarch together in a saucepan until thickened. Add craisins to taste, about 1/8 cup. 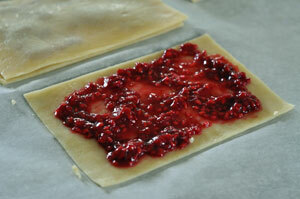 Roll out the pastry dough and cut out 3 inch by 5 inch rectangles. 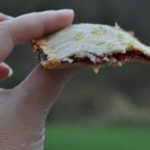 Place a thin layer of pear filling in the middle of one pastry rectangle leaving a half inch border all around the edge. Cover with another rectangle and crimp edges to bind the two rectangles together. Bake at 375 degrees for 15 to 20 minutes or until golden brown. Cool. Mix together the powdered sugar and milk. Add more sugar or milk as needed to get a nice thickly pourable consistency. 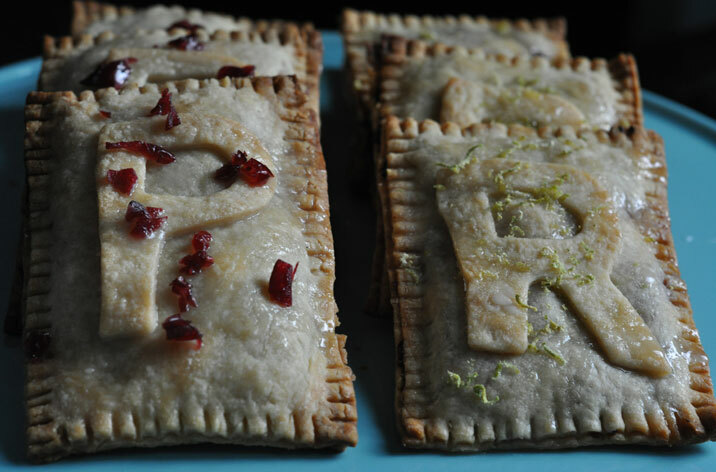 Frost the cooled poptarts & sprinkle on leftover chopped up craisins. Cook & stir constantly the raspberries, sugar, zest of one lime and cornstarch together in a saucepan until thickened. 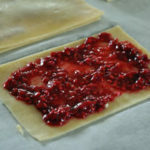 Place a thin layer of raspberry filling in the middle of one pastry rectangle leaving a half inch border all around the edge. Cover with another rectangle and crimp edges to bind the two rectangles together. Mix together the powdered sugar and juice of two limes and zest of one lime. Add more sugar or juice as needed to get a nice thickly pourable consistency.